The Archbishop of Milan and six other bishops were appointed to perform the ceremony of taking from Huss the office of priest. This done, the words rang out, ‘We commit thy soul to the devil’. ‘And I commit it to the Lord Jesus Christ’ cried the prisoner. As they hurried him to the place of burning ‘a crown of blasphemy’ was put on his head, bearing the words, ‘This is an arch heretic’, and depicting devils tearing his soul. Huss was a further voice proclaiming that the Bible, and not popes or priests, was the infallible guide for faith and life, and that the church should be compared to and seek to live up to its New Testament original. Although a popular and influential preacher and writer, Huss somehow sensed that he was one ‘making straight paths’ for others to follow. It was almost exactly 100 years later that Luther ‘broke through’, hammering 95 theses to the Wittenberg Church door. One of those powerfully influenced by the teachings and writings of Wycliffe was Jan Huss of Prague, Bohemia. Huss was a student ‘of peasant stock’ (says Houghton in Church Sketches, BOT) and then later became Rector of the University of Prague. He was not only impacted by Wycliffe’s books but also by two cartoons which he saw. One showed the Lord Jesus wearing a crown of thorns and the pope beside Him wearing a crown of gold. The other showed the Lord Jesus saying to a poor woman, ‘Thy sins are forgiven thee’ and then the pope selling indulgences to the poor. These satirical and comical visual images motivated him and he began preaching, teaching and writing after the style of Wycliffe. The church authorities denounced him as a heretic and burnt both his and Wycliffe’s books. He was excommunicated by the pope in 1410 and later arrested and summoned before a tribunal. The trial was a terrible sham in which Huss was hardly allowed to speak. He was accused of proclaiming himself the fourth person of the Trinity. And he was then duly condemned as a heretic. 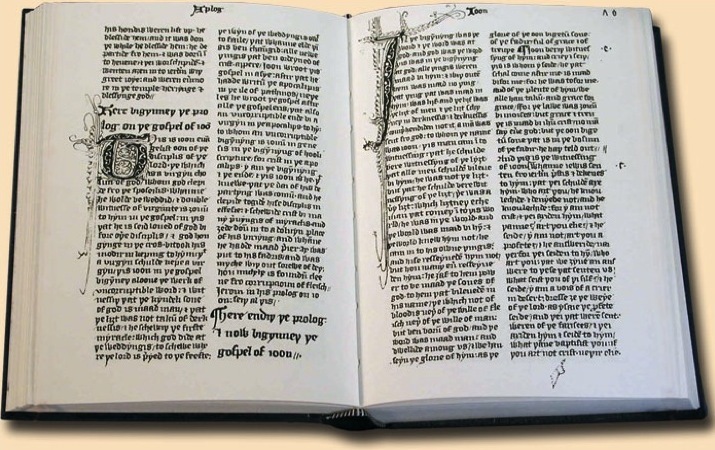 Having rebuked the religious corruptions, and preached the gospel amongst the ordinary folk of England, John Wycliffe’s most significant attainment was the translation of the whole Bible into the English language so that all could freely read it. He translated from the Latin version, the only text available to him. Despite the obvious limitations of his translation, for the first time people could read the Scriptures for themselves. At long last the Bible was out! 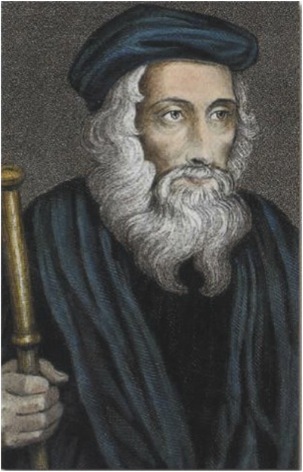 Although his relationship with Oxford University ended unhappily, he was forced to leave in 1381, surely John Wycliffe is that University’s greatest bestowal to the modern world. Alas! The story doesn’t quite end there. Dr. Donald Roberts, writing for Christian History Magazine, tells us, ‘In 1415 the Council of Constance burned John Hus at the stake, and also condemned John Wycliffe on 260 different counts. But it was too late – the Bible, the Living Word of God was out. The Bible was confidently declared to be the only infallible guide for faith and practice. Wycliffe and his Lollards declared the Bible to be above church, popes and priests and what a change was about to break over Europe! Born near Old Richmond, Yorkshire, educated and established as a leading theologian and educator at Oxford University in the fourteenth century, Wycliffe has been called the ‘morning star’ of the Reformation. He won the favour of the English King by publishing a pamphlet arguing that the Pope had no right to levy a tax against England to be sent to Rome. An argument that the King liked! He was incredibly popular with the common people but when he attacked the Catholic doctrine of transubstantiation both University and the King began to withdraw support from him. The idea behind transubstatiation was that during the Mass service, the bread and wine are transformed by the priest into the literal body and blood of Jesus. The English phrase ‘hocus pocus’ comes from the Latin phrases the priests uttered in order to make this so-called transformation take place and is a fine early example of dry, derisive English humour.